Thank you for selecting our office for your care and treatment. Our goal is to provide quality comprehensive endodontic treatment using state of the art technology. We understand you are likely seeing us for the first time and we are aware that you may feel some anxiety when you arrive at our office. Knowing this, our waiting room is designed to provide a pleasant atmosphere which will hopefully put you at ease. Our staff has a combined 83 years of dental experience and can help you address your anxiety about endodontic treatment. We look forward to meeting you and will do our utmost to make this a comfortable experience. Dental xrays are essential, preventative, diagnostic tools that provide valuable information not visible during a regular dental exam. Dentists use this information to safely and accurately detect hidden dental abnormalities, infections and complete an accurate treatment plan. Without xrays, problem areas may go undetected. Our office uses a digital xray system for individual films, as well as a Cone Beam CT scan machine for cases that require a more detailed view of the area of concern. If you are asked to have a Cone Beam CT or CBCT scan while in our office please keep in mind the dental CT scan differs from a medical CT scan. Cone Beam CT scans are performed while the patient is standing up and takes less that 2 minutes to complete. Dental xrays and CT scans both produce a low level of radiation and are considered safe. Dentists take necessary precautions to limit the patient's exposure to radiation when taking dental xrays and CT scans. These precautions include using lead apron shields to protect the body and using modern, digital sensors that cut down the exposure time of each xray. If you are pregnant, we would not want to expose your to such radiation unnecessarily. If your are or could be pregnant please let us know immediately. We will discuss the options with you and your doctor. The need for dental xrays depends on each patient's individual dental health needs. Dr Pearson will recommend necessary xrays based on the review of your medical and dental history, dental exam, signs and symptoms. Dr. Pearson received a B.A. in Biology from Hendrix College in 1979. He received his D.D.S. from Louisiana State University School of Dentistry in 1985. 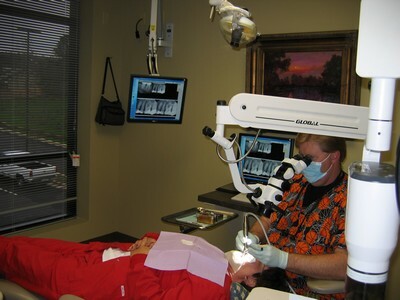 He completed a 2 year residency in Endodontics at the University of Texas Health Science Center at San Antonio in 1991. Our office is known for the personal care we give to each patient. We are also known for our professional commitment to excellence. We have incorporated the latest technology including the surgical operating microscope which brings even the smallest detail clearly into view. We have replaced the conventional dental x-rays with digital radiography which reduces radiation exposure of our patients up to 90% and eliminates environmental exposure of the hazardous byproducts of film developing. We treat our waterlines and the water that flows through our handpieces with a product called sterilox. This is an oxidating agent that prevents biofilm from accumulating in the waterlines. Our website is for the convenience of both our patients and referring doctors. We encourage you to pre-register at this site to save you time when you come to our office. The registration is simple but if you have any questions please call our office for help.